The Beauty of the Lake Superior Shoreline. Pictured Rocks National Lakeshore occupies 42 miles along Lake Superior around Munising, Michigan in the Upper Peninsula. It is best known for its 15 miles of colorful sandstone cliffs located northeast of Munising. The Pictured Rocks have been compared to Niagara Falls, Mammoth Cave and the Hudson River Valley as among the most striking scenery in eastern North America. However, they have been spared the effects of tourism due to their remote location. Pictured Rocks was the first National Lakeshore in the country, signed into law by President Lyndon B Johnson in 1966. The Pictured Rocks cliffs are composed of 500 million year old sandstone. The minerals and groundwater seepage created the natural works of art. Michigan started considering bringing Pictured Rocks within the state park system in the 1920s. However, other locations had more political clout or were in greater danger due to economic development. Although Munising set aside 27 acres around Miners Castle, it wasn’t until the 1950s that action began. Mission 66 was a ten year program to expand and upgrade national park system facilities by 1966, the fiftieth anniversary of its creation. As part of this project, the survey of the Great Lakes recognized Pictured Rocks as an area of significance. Senator Philip Hart was a Democratic Senator from Michigan and introduced bills to protect both Pictured Rocks and Sleeping Bear Dunes. The plan to protect Pictured Rocks was opposed by loggers and forest land owners. The creation of the Cape Cod National Seashore by Congress in 1961 provided a template to overcome the local issues. In Cape Cod, Congress approved money to purchase park land and allowed numerous small towns to remain in the park boundaries. Since 1966, when Congress created Pictured Rocks National Lakeshore, it has faced issues blending its mission to provide a recreation area and bolster local economic development with the core National Park Service mission as an environmental steward. Miners Castle is a large rock on the Pictured Rocks cliff that was named Miners Castle by Englishman Alexander Henry’s employees in 1771. 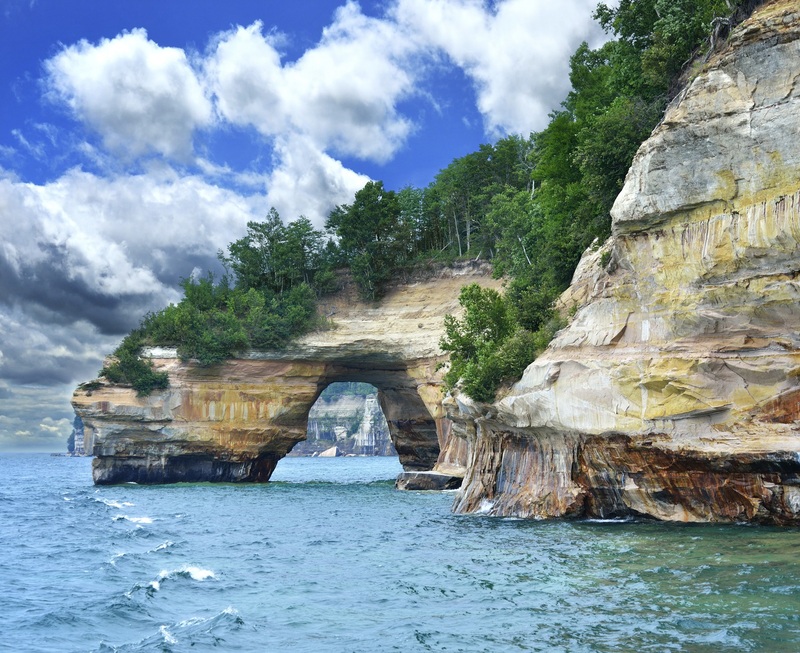 It is the most famous rock formation of the Pictured Rocks and the area provides three overlooks for viewing the surrounding cliffs and Grand Island. Miners Castle is located about 10 miles northeast of Munising. Pictured Rocks Cruises is the authorized concessionaire of the National Parks Service. They have been providing boat cruises in the summer along 40 miles of the most beautiful shoreline. They offer three options including a Sunset Cruise (departs later in the day) and a Spray Falls Cruise which goes farther to see the 70 foot waterfall. Boats board from the Munising City Dock. Shipwreck Tours – Explore the depths of Lake Superior around Pictured Rocks with a glass bottom boat tour. The tour visits two different shipwreck sites as well as a historic lighthouse and the cliffs of Grand Island and Munising Bay. Trips happen from Memorial Day weekend until October. There are a number of guided sea kayak tours of the Lake Superior shoreline offered out of Munising. Paddling Michigan, Pictured Rocks Kayaking and Northern Water Adventures offer various options to allow you to see the Pictured Rocks cliffs from the water. Within the national lakeshore, there are several backcountry campsites that are reached by trail and four drive-in campgrounds. The drive-in campgrounds are at Hurricane River, Little Beaver Lake and Twelvemile Beach. Between these 4 sites, there are approximately 65 campsites. There is no other lodging available inside the national lakeshore. There are several nearby campgrounds in Hiawatha National Forest, Lake Superior State Forest and Muskallonge Lake State Park. There is also Woodland Park Campground, which is a municipal operation near Grand Marais that can accommodate both tents and RVs. Nearby lodging is available in both Munising and Grand Marais. Grand Marais options include the North Shore Lodge, Hilltop Cabins and Motel, Beach Park Motel and Voyageurs Motel. Munising lodging options include the Holiday Inn Express, Munising Motel, AmericInn, Pictured Rocks Inn, Hillcrest Motel & Cabins, Sunset Motel, Beach Inn Motel and Alger Falls Motel.